Elisa realized her iPhone 5 was missing as soon as we got home. While she searched her purse and jacket again, I signed into her account on iCloud.com and activated the Find My iPhone app. Immediately, GPS data showed that the phone was around 71st and Amsterdam, a mile north of our Manhattan apartment at 58th and 9th Ave. The phone was in the backseat of the taxi we had taken from Union Square. We quickly looked up advice on the Internet, called 311, wished we had gotten a receipt that would show the taxi medallion number, called a police number that operator gave us, and filed a Yellow Taxi Lost and Found form. These are all appropriate steps to take eventually. But at the moment they were a waste of time. 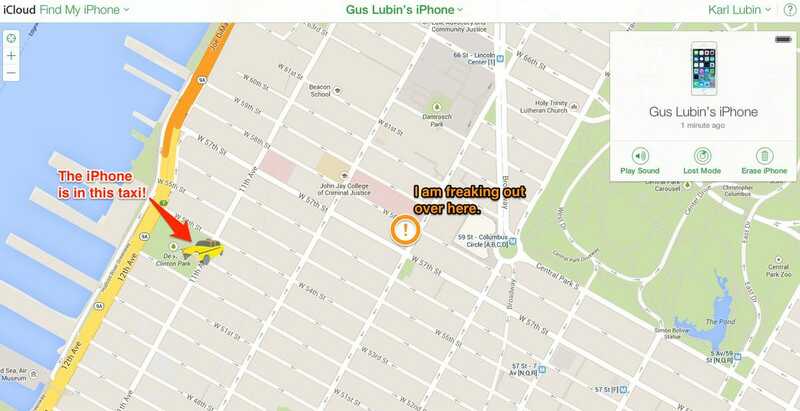 The key to getting the phone back immediately is right there in the Find My iPhone app. Click on the My Devices menu at the center of the screen, select the missing phone, and from the window that pops up select "Lost Mode." This will lock the phone and give you the option to display a message directing people to call another phone number to return it. If you use a passcode, as you should, then a Lost Mode message is the only way that a kind stranger will know whom to call. You can also make the phone emit a sound to help people find it. There is also an option to wipe your phone if it comes to that. While I continued pinging the phone, however, I got no response. Meanwhile, it had moved to 53rd and 11th ave. It was then that Elisa, a near-native New Yorker, made a clutch decision. Noticing that the phone had stayed put for a few moments, she hurried to the bedroom and changed from a dress to pants and shoes, so she could move fast. She said she was going over there — 0.6 miles away — in hopes that the driver was taking a break — around 9 p.m., four hours into his night shift. She took my phone and ran out the door. I sat at the computer watching the GPS locator, very worried it would start moving again, and kept pinging the phone. Ten minutes later — still no movement — I figured out how to place a call using Google Voice and I dialed my phone, which Elisa was carrying. She answered, breathless but happy. She had found the phone. A bunch of taxis had been parked on 11th Ave by De Witt Clinton Park, and she had peered into them one-by-one, lighting the backseat with the other phone. She had found the phone in an empty taxi and found the driver standing nearby drinking a Big Gulp soda. He had been shocked that she found him but was happy to hand over the phone. I learned from this experience that Find My iPhone and Lost Mode are key to getting back a phone immediately. The former shows whether your phone is really in a taxi, and also whether it is within running distance. The latter provides the only effective way of communicating with kind strangers. Sometimes you won't be able to get the phone back immediately, however, in which case you will have to call 311. It helps immensely if you can identify the taxi's medallion number, so keep your receipts or pay with an app that keeps receipts for you. Even if you don't have the number, there's a good chance you will recover your phone, assuming drivers follow the rules for lost items.